Living in a new state, miles from my comfort zone, has been more of a challenge than I would have imagined. I moved from a metropolitan area to a rural town, went from being known to being unknown, from being confident in my purpose to wavering in my direction. The changes have put me on edge, feeling lonely and fearful of the future. In addition to the physical changes, and emotional losses, I am now feeling a pressing need to be more spiritually vulnerable. Awareness of my hidden pride is becoming more evident to me and is pounding on my soul, needing to be released. The pride in me is disgusted with my pride. How could it be?…I am indeed prideful! My dissatisfaction stems from a need for my circumstance to assuage my heart. To feel valued and worthy I need certain circumstances to fill the “not valued” and “not worthy” wound of my heart. Circumstances feed my pride. The middle letter in pride is I which points to the focus of pride. I am worthy if I am known and belong. Pride causes the focus to be on self and not the amazing love of God. This pride is a contributor to my weak confidence in my calling. 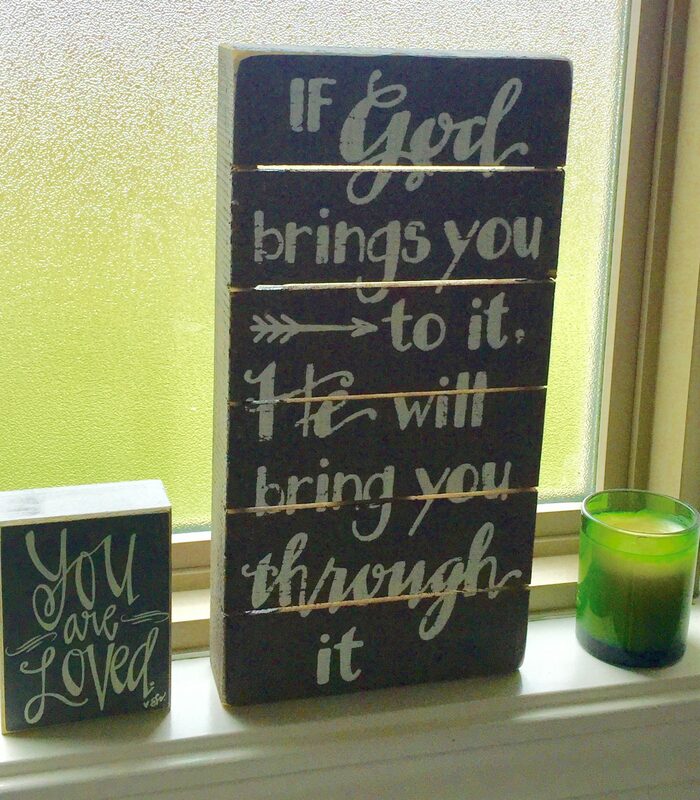 “If God brings you to it, He will bring you through it” daily screams the quote from its perch on the windowsill of my bathroom. I needed to let go of my pride and lean in on my Father to soothe my losses and invigorate my calling. Nestled next to the screaming quote on the window sill is a small but hugely important bearer of a healing truth – YOU ARE LOVED. That is the answer to dispelling my pesty pride…I need to live out of the truth that I am loved by the creator of the universe! That is all I need, trusting His love. In the words of C.S. Lewis, “Pride always means enmity … not only enmity between man and man but enmity to God.” When I am focusing on what I need instead of submitting peacefully to the will of God I am not trusting God’s plan and His love for me. A prideful life is living without faith. A definition of faith written in the Amplified Classic edition of the Bible is: leaning of the entire human personality on God in absolute trust and confidence in His power, wisdom, and goodness. My admission of the guilt of pride is fortifying my conviction to press forward in this place with “absolute trust and confidence in His power, wisdom, and goodness” and let only the presence of His love fill my heart! As Romans 8:38 proclaims, “nothing can separate us from God’s love”, not even our fears. When we are prideful and fearful we are leaning away from a trusting faith. God then leans in to be available with His “goodness” his amazing grace-filled love and forgiveness. How do we “taste His goodness”? To taste God’s goodness we must first have a taste for God. To taste (a verb), consume, discern and experience God’s goodness we must first have a taste (a noun), an appetite, a desire and a preference for God. The converse is also true, the more we taste God’s goodness, the more we will have a taste for His presence in our lives. Tasting is a choice that will lead to a life-giving peace. Pridefulness is a choice that stifles the peace in our hearts. To allow God’s goodness to satisfy our taste, to heal our hurt, to supply our insufficiencies and fill our every need takes deliberate acts that will deliver us from our fearful pride. Please listen to Audrey Assad’s song I Shall Not Want. Hey Cathy I moved to my hometown where you can drive down the middle of the street?. I can’t imagine you being prideful, but I know your faith will carry you whatever the circumstances. Your words inspire and bring glory to our Father. Blessings and prayers. Thanks for your encouragement. It really is a relief to let go of some soul bounding pride and be free to rely more fully on God.